The term “redd” refers to the spawning bed of trout in a river or stream. Redds can be identified by a bowl-shaped indentation of clean bright rocks. 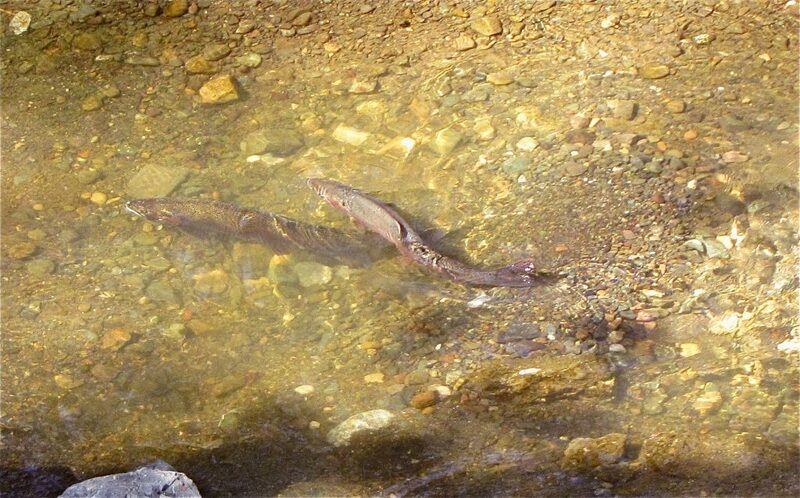 Redds are formed by trout beating the rocks with their tail-fin. Trout do this to remove moss, dirt, bigger rocks, and debris. This allows for the eggs to sink safely to the bottom of the river. Having the bed as clean as possible ensures that the eggs will be fully fertilized. Don’t walk on redds or directly upriver of the redd — this causes disruption to the bed and will get sediment into the clean rocks. Trout need water to be crystal clear for eggs to be fully fertilized. Even walking above the redd can push sediment deposits onto the red. Preservation of the active redds is essential for the sustainability of natural trout reproduction in our river. Trout are most vulnerable on the redds because they are in shallow, clear water. This means they can be easily fished to and easily spotted. This may be enticing for most anglers, but the temptation must be resisted to protect the longevity of our fisheries for generations to come. Instead of pulling reproducing fish off of their beds, fish behind the active bed for fish anticipating stray eggs floating down river. These anticipating fish are actively and aggressively feeding. When fishing behind the redd, one should be cautious not to cast directly onto the redd because weights and larger flies can also cause damage. If you see other people fishing active fish on a redd, do not confront them in a confrontational matter, but assume that it is lack of education and knowledge. The more people who are aware and educated about redd etiquette, the better!